The food served in the restaurant is of a good standard, the all inclusive package serves drinks from 10.00am till midnight, this includes beer, wine, cava, sangria, spirits, soft drinks, tea, coffee etc. Snacks are available during the day from the pool bar, ice creams and ice lollies are also available to all guests. The sun bed race starts about 7.30am when guests place chairs around the pools and then swop them for sunbeds when the staff unlock them but it is easy to get a bed later in the day (I do not know what it is like in high season ) The entertainment is good with a kiddies disco followed by bingo (if you want to play, the prize was about 200 euros plus) this is then followed by either the animation team putting on a show or a professional show ie dancing troop, Rod Stewart etc. The only negativity this year was the drunken behaviour of some guests on their first night of the AI drinks, this happened two nights in a row, the first time they were playing a drinking game with a pack of cards and a table full of alcohol and the noise was quite loud but there was no trouble, the second night a guy took of his shoe and threw it at the stage at this point he was told by one of his fellow countrymen to behave, he must have said something back as the person who told him to behave then flew at him only to be held back by his wife, at this point I jumped up to help him along with several others (my wife asked what I was going to do as I am 63, I replied that I would have got the first punch in!) Were these hooligans British? No they were FRENCH! I passed one of them the next day and he looked awful sheepish BUT this was one off and would not stop us returning to this 3 star plus hotel. Our trip toward the end of May was our fourth visit to the Hotel Corfu/Skorpios complex. You should be aware that there are two hotels with the Skorpios the one nearest to the sea and the Corfu overlooking the sandy beach and pool area. We stayed in the Skorpios and we have now stayed twice in both. Although the Corfu has been open since the start of the season; the Skorpios only opened on the Tuesday as we arrived on the Wednesday; within the week it pretty much went from being empty to full. Many guests were like us making several repeat visits. The food was good and the choices were plenty; it is all inclusive, self-service and at every meal time we found something that was tasty to eat. The Breakfast was overwhelming and included everything you would want from an English breakfast; beans, fried/scrambled/boiled egg, English sausage, back bacon, mushrooms, grilled tomato, hash brown, onion rings, toast and fried bread. There was also plenty of cereals, fruit, yoghurts, cakes, rolls, jams and the cold cheese and meats. Drinks were juices, coffeee, tea and hot chocolate. The lunches and evening meals offered plenty of choices paella, chicken, pork, beef steaks, cold meats and salads, pasta for example and although not vegetarian the separate selection looked quite varied to me. The sweets were good, cakes, mousse, cheese and biscuits, fruit and there was always a pudding with English custard available. The room was very comfortable with a safe(payable at Reception) and TV(control available at Reception). The TV channels available are poor and I had taken my netbook as the hotel now has Wi-Fi which is available throughout the hotel (free to returning guests) at â‚¬15 for the week; so we listened to our local Radio station back home to keep up with events and this was most useful as the Ash Cloud threatened the last two days of our stay and we were able to keep track of the situation. There is a fridge in the room and plenty of wardrobe and cupboard space; the bed was comfortable, small balcony with a fold down clothes maiden on it. The bathroom was fine, but the showers aren't the best and because we were on the top floor it took a while for the water to come hot in the washbasin. Air conditioning which you controlled and three electric sockets in the bedroom area. As returning guests we received a tray with two cups; kettle; tea bags and sugar. On day two we had a knock on the door and were presented with a bottle of wine; two glasses and a card welcoming us back to the hotel. The pool bar(snacks available 10 till 6) also doubles as the main bar for the evening entertainment and the good shows we saw included a Beatles Tribute Band and Rud Stewart. There is a bar terrace overlooking the sand at the Corfu and the Skorpios also has a terrace which overlooks the sea; it also has a higher terrace above that which gives extended sea views. You can use your wristband to get drinks at both of the hotels. The beer is Aguila and the whisky is blended and OK; the wife was on Baileys and she said that was fine; there is quite a selection of locally produced drinks and for a week and being All Inclusive we didn’t have any complaints about them. The staff were very friendly and it was good to see the return of Carol behind one of the bars(she wasn’t there last year, but was the year before) throw some coins into the tip jar and she rings the bell and gabbles away in Spanish at the top of her voice, very amusing! Also good natured was Alvaro and Marta always ready to serve and have a chat. Just outside of the hotel complex is a small commercial centre which is Cala Egos and here you have a chemist, tobacconist, newsagent, various supermarkets(the big Eroski one is the cheapest) many bars, restaurants, a doctors, exchange places, perfume shops, souvenir shops, car rental and excursion shops. A 20 minute walk away is the Marina. All in all this hotel complex is good and incredible value. If you want to join in the comps going on all day then you can; if you just want to chat, read and relax you can do that too. I find it such a tranquil place that suits us just fine! Hope you find this review helpful. We stayed in the marina Scorpios in Cala Egos in October 2010 for 2 weeks. The staff were fantastic the food was good and the entertainment was good as it was the end of season and brought indoors at night and only 3 reps instead of the usual 10 in the early summer period. The kids club was great until the girl had a day off then the other 2 didn't want to take the kids club but not everyone is suited to entertaining the kids. We enjoyed it so much that a lot of the people we met from all over UK are going back this year we are going back and are really looking forward to it. The staff are so friendly nothing is a bother. The rooms are clean and tidy you are only sleeping there, it doesn't need to be a palace. There is a nice little market that comes to the town on a Thursday night you don't really have to leave the hotel but if you fancy a trip to Cala Dor go on the little train you see so much the marina is gorgeous. We have just arrived back from this hotel and have already checked prices out for next year. We have done many all inclusives in the med and this hotel is the best we have ever stayed in. The food was amazing with lots of choice for all every night, snacks all day were brilliant if you didnt want to go the restaurant. Full english breakfast every morning plus fruit, toast and cerals. The entertainment here is by the far the best during the day they play 6 games a day for adults and kids so there is something for everyone to join in if you want to and no pressure if you dont. Evening entertainment was good more in house shows but there were very good at them, bingo every night and our kids loved the disco. Rooms cleaned daily. 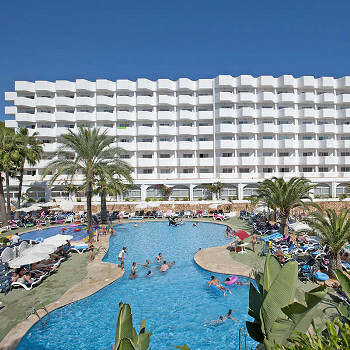 Overall we found this hotel to be excellent it provides a safe friendly fun holiday for all the family. very pleased and we will be returning next year. never had to queue too long at the bar the limited amount of staff worked really hard and were always friendly and pleasant.The land train into Cala Dor stops right outside the hotel and it doesn't take long to get there,quite a few souvenir shops,restaurants,bars,chemists,doctors and cash points a few minutes walk from the hotel so theres no need to leave cala egos if you don't want to.All hotel staff were friendly and seemed happy to enjoy working there which created a great atmsophere.The entertainment team were great without being pushy,kids rep Katie done a great job in entertaining as many as 26 kids at a time and always remembered there names and made sure they all had sunscreen on when they went down to the beach!the only negative things I could say are housekeeping-floor in our room wasn't swept once in our 10 days,nor was bedding changed.The beach in between the corfu and its sister hotel Skorpios was a bit dirty,plastic cups and rubbish from the hotel guests and did pong a bit.Will def return next year! what a gem. The food was genurally good, what else can you expect for unlimited free food, great dinners. Private beach, with lovely views from the rocks and villas surrounding the beach. Nice little town 100 m down the road with basic shops and a great bar called SPARKLES, which is a sports bar by day, then karaoki and night club untill 4 in the morning. Great staff, all enthusiastic, made great mates with them and they are great with all ages. entertainment great for all ages!! We booked to stay in the Skorpios (the sister hotel) but was put in the Corfu. Check in was very quick as only our group had been dropped off at the hotel. Our room was on the 1st floor (room 118), the rooms are quite spacious and clean. There is a fridge and TV (our TV had no volume down button so we did not use it). There is also a hairdryer in the bathroom. Towels and bed linen were changed frequently during our 2 week stay. 2 of our party had rooms overlooking the terrace area, it was the norm for the foreign guests to sit out on the terrace until 2am creating alot of noise. The pool and terrace areas are very tidy although if it gets too hot there is a lack of shaded areas to sit in. Sunbeds are unlocked at 9am but spaces are reserved using chairs at 7am, there were still sunbeds to use so we did not bother reserving spaces. Meals are exactly as already stated on other reviews. Breakfast consists of cereals, fried breakfasts, toast and fruit. Lunch and dinner offered a wide range of salads, meats and vegetables. There was a vegetarian area aswell. Entertainment was provided throughout the day with various activities (rifle shooting, mini golf tournament, water basketball, water polo, football, killer darts and killer pool). At night the entertainment started at 8.30 with kids mini disco followed by Bingo with the main show starting at 10. Excellent Hotel, Staff, Food, Cleanliness and Location. Couldn't fault it. Had a 4th floor sea-view room, fantastic. Staff were so friendly and food was excellent with a lot of choice at every sitting. We certainly had good value with the All-Inclusive package. Would recommend. Several steps around the hotel so perhaps not suitable for people with walking difficulties. After reading some of the reports on this hotel, I was wondering if we had made the right decision to go, in the end we went and im glad we went, it was the best hotel ive ever stayed in. When we booked we were told we could stay in the marina corfu or its sister hotel the skorpius, luckily we stayed in the corfu which im glad of. When we arrived the reception staff were lovely especially barbara. She spoke excellent english as did the other reception staff. I had requested a high floor with a pool and sea view and I got exactly what I asked for so its worth while asking.